One culprit of a messy space is not having a wastebasket in it. Tip: Place an open wastebasket in every room in your home and see a lot of the mess disappear. No lid litter bins are better for quick dumping (no lifting of lid necessary nor stepping on a pedal to open). Place this bin nearby where you usually park in a space. Choose a good sized one to accommodate more trash. 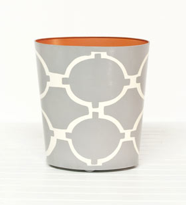 Design your own like this Acadia Gray and Cream custom hand-painted wastebasket from worlds-away.com. Check this DIY Basketball Stand Wastebasket from artfire.com. Lidded bins are best for kitchen use. Love this sensor trash bin from simplehuman. The lid automatically lifts with just a wave of your hand. Homestyle Mesh Wastebaskets available at ACE Hardware. These can also be found at SM and Landmark Dept. Stores in silver and black shades. I like the triangle one, you can cozy it up in a corner which I like to think makes it easier to score when you try to shoot in trash. Try spray painting these metal wastebaskets from Ace if you prefer more fun colors. For sorting recyclables – Stainless Steel 2 Compartment Metal Bin from Howard’s Storage World. *Photo Credits: All photos are from mentioned websites. You are currently browsing entries tagged with wastebasket at Space That Works.